360fly 4k Camera - The Best POV camera for kiting? Let’s face it – cameras, videos, social media selfies of glory are pretty massively intertwined into sports. Performing in an athletic discipline is nowadays only as equally as important as having it captured for the interweb to spectacle over. The old… “If a tree falls in the forest and no one hears it, does it make a sound?” – well on the net no it doesn’t, you need video to capture it! So, POV cameras were invented to prove to all your mates that you stomped that triple mega-loop, or TP’ed your old principal’s house. And now the tech of these cameras is going CRAZY! Hard on the brands that initially started the craze, with so much competition, but exciting stuff for the consumer. Let the POV camera tech race begin! Virtual Reality (VR) makes me think of some crazy scientist (RIP Christopher Lloyd) from Back to the Future with wires hooked up to your brain. It’s all a bit over the top and just too much fuss. Unless you really can time travel, what’s the point? I mean, I know I’m not alone when I say I can’t be bothered keeping up with all this tech. I have a phone, it works. I have my old GoPro, it works. So why do I need to keep trying new stuff? Well, I didn’t till the folks at 360Fly sent us a demo model just to have a play. And when new tech arrives on your doorstep that little kid that used to watch Back to the Future fires up once again. Ahhh ok then, why not Doc?. 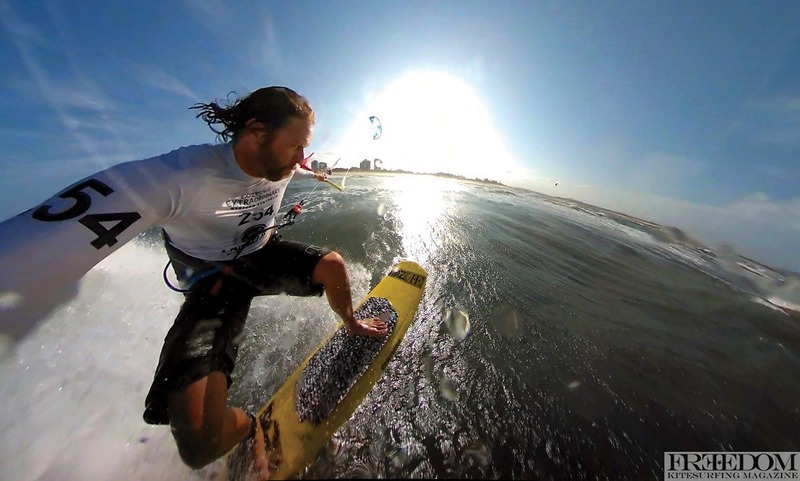 The 360fly 4k is possibly the best POV camera for kitesurfing for this price! Lol, what the hell is it?! It looks like an alien pod – a very nicely made alien pod. Maybe it was made by aliens, who knows? I mean it’s round. Yes, a round golf ball looking camera. It screams high quality from the packaging up – I guess its gotta be good! I’m not a ‘read the manual’ type guy, but I must admit I did for this. Not so much to figure out how to turn it on, but how to film with it! I mean, 360? Why? How? YOU DON’T NEED TO AIM IT AT ANYTHING. I mean, you need to understand where the best spots on the lens are, but as long as you are holding it stable, facing up, and everything around it is in clear view of its little bubble lens, it captures everything around it, minus directly below. I find this friggin’ awesome. And it’s the determining factor for why I would buy one. How many times have you gone to use your POV camera and missed the shot because it was aiming too low or too high? Ok, so this baby captures the LOW and the HIGH views at once and then in the editing program (included for free) you can just zoom in on the view that you want! The cool thing about this camera is no need to aim it – it captures everything so you wont miss that shot! At only $300 for the full kit (floaty handle and dive case) this is one pretty cool highly affordable camera! 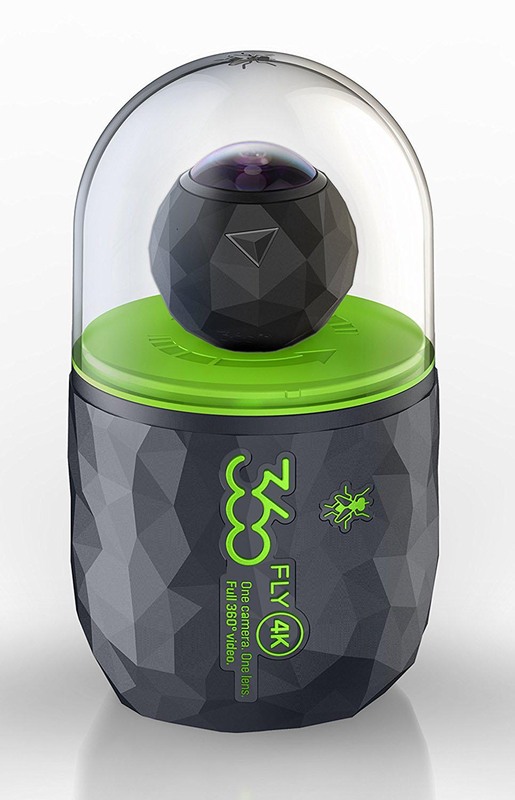 Ok, if that’s still too complex for your little human brain to conceive, then just hold the 360Fly like you would any POV camera (with the lens pointing at your subject) and it works just like your standard POV camera automatically. Having options like this is pretty cool. Panoramic Video screen grabs are amazing – capture both forward and backward views at once! THE OTHER BIG PART OF THIS CAMERA IS AS WE MENTIONED, VR. I took this camera for a walk to my local bakery – just to buy a yummy fresh sausage roll – and filmed the whole thing holding the camera down low near my waist. Back at home, I threw on a cheap VR headset and WOW, mind blown! Watching the footage back felt like I was a little kid waist high travelling along next to me looking up and around at the big wide world. What a TRIP! VR headsets are cheap ranging from $10 up to the more advanced ones for several hundred dollars, but the cheap ones are still pretty cool! OK, SO HOW DOES THIS HOLD UP FOR KITESURFING? 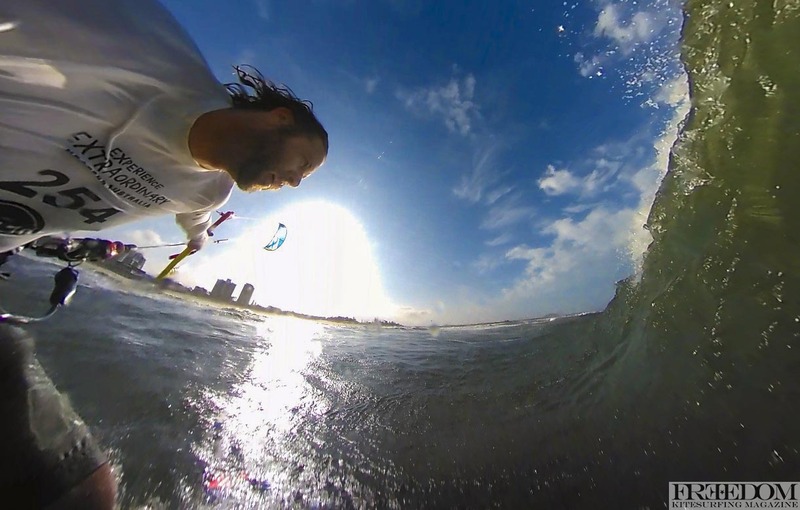 Here’s the big thing with any camera while kiting – stabilisation. It does a pretty good job with built-in stabilisation, but to watch it in VR or to make a flattened movie you will need to try your hardest to keep it from bouncing around. 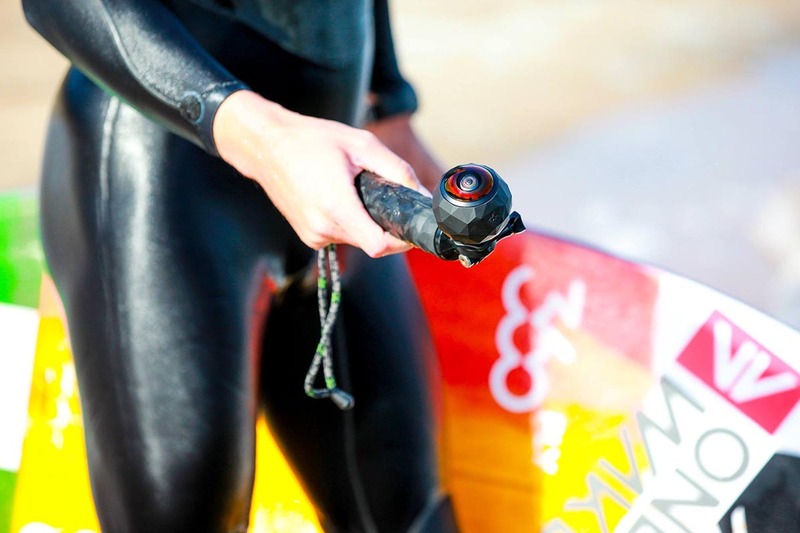 I found holding it with the floaty handle (pictured) seemed to get the best results, rather than any type of body mount. Also, change the FPS to 60 so you can slow it down to reduce fast shakes. Still-image shots from the video look amazingly good and crisp. In our print magazine recently we printed the picture above at full page A4 and it looks like a real photo! We haven’t tried mounting it to the kite lines yet. It’s a little heavier than other POV cameras, so I’m reluctant to as things can get messy when your lines go slack. Strapped to the kite itself could be pretty cool and VR from up there should look amazing! Heres the next big drawcard – THE PRICE! • Vibrates once when you turn it on, twice when you turn it off – no silly beeps that you can’t hear when it’s windy, you can really feel it! • No need to aim it – just hold it low and level and hit the one button (doesn’t film directly down). • Comes with 64gig card! • Super cool for other things like capturing parties, just put it in middle of the room and film everything! • The free editing software has a mode called ‘watch me’ that lets you using touch gestures to move the viewing angle around, to make standard flat movies – very cool! • Has live streaming features. • The one button takes video only, you need the app running to take photos. BUT the screengrabs from the videos are excellent (as seen on this page).